NZDH Competitors supporting the youngest U15 Development squad. The 2nd round of New Zealand’s Downhill Championship Series took place at Levin’s Matariki Forest over the weekend. The Levin National Downhill Track has been out of commission since the 2009 Summer Nationals, it was great to have this well renown venue hosting a series round. It was great to see 104 rider entrants sign in for what turned out to be an outstanding weekend of Racing… including great weather!! Levin – Manawatu had been enjoying a long spell of dry weather over the last 10 days until rain and showers leading up to the race weekend made the once ideal dusty track conditions into a physical demanding road ahead for the riders on practice day. As the practice day progressed, the cloud started to clear and new race lines were beginning to appear. After speaking to the familiar faces, the newly revived racers were commenting on how they are enjoying what they are seeing with the development of the new series. The end of practice finished at 4.00pm with most competitors managing to dial in on the fast improving track conditions. The new Levin venue managed to side step a huge amount of rain that fell within kilometers from the track, which was a perfect outcome for the weekend as a lot of riders had been commenting throughout the day… “will we ever have a fine weekend of racing”! Morning Race day weather conditions were simply outstanding, a clear blue sky greeted the riders of which brought even more ideal track conditions than the previous practice day. The once tacky race lines were now fast and smooth running, the technical final off cambered section was now hooking up well for the riders, so it was now possible to select the higher lines of which would be delivering faster race times. Race day started right on time at 12.00noon. The 1st class of riders were the women’s field of 4 riders, followed by the masters men class who were enjoying the perfect conditions. Sarah Atkin once again fully dominated the women’s class, but good to see various other women riders competing again after a long break. Masters Men’s, Cambell Wilson was also showing his usual dominance by leading this class by a full 8 seconds to his closest rival. Next up was the youngest class of men with the U15 riders who were dominated by local home town young man Jack Humphries on their 1st run. The U17-19 and Open men’s class times were hotly contested, with Louis Hamilton leading the way followed closely by the youngest of the 3 classes Lawrence Cawte and then Senior men’s Jonathan Andrews. These 3 classes were going to be tightly contested in their final race run. The Pro Elite Riders once again proved their worth by displaying the fastest times of the day with local competitor Stefan Gardner coming down the Mountain a full 15secs faster than any other class with Matt Walker close behind. It was a shame to have Levin’s International MTB Downhill competitor Nathan Rankin pull out of the Elite Class for the final race runs due to developing an ankle injury while warming up in the initial practice runs earlier on in the day. Another well renown NZ International Pro Elite rider, George Branigan. who has just returned back home from competing the World Cup Circuit was also out for the final race day because of rear suspension failure that could not be rectified due to no replacement parts available in time for the main race event. We will be looking forward to seeing these two World Class riders competing against the local hot title favorites at round 3 in Napier in a month’s time. The 2nd and final race run conditions were now absolutely perfect of which all competitors were prepared with great enthusiasm to come down the mountain and try and improve on their 1st run times. The final women’s run once again was totally dominated by Sarah Atkin, Sarah is riding well. Next up was the Masters class of which once again, Wellington rider Campbell Wilson who took control of this class and placed himself on the top step of the podium. The young under 15 men squad who were also enjoying the perfect track conditions could not keep the local current U15 National Champ competitor Jack Humphries at bay with Round 1 winner Matt Lawton having to settle for 2nd spot. The very competitive Under 17 – 19 and Senior Men’s class final run results were a complete turnaround from their 1st race run times with Senior men’s Jonathan Andrews producing the best time followed closely by 1 sec from U17’s class hot favorite Lawrence Cawte beating current U19 star Louis Hamilton by the slimmest of margins! The eagerly awaited final Pro Elite race run witnessed round one 2nd place competitor Matt Walker take the Round 2 overall win by the slimmest of margins, .12 of a second was all that separated local Stefan Gardner from taking the top spot for the weekend of which gives Matt Walker the series lead top podium step as the New Zealand Downhill Championships road show head to Hawkes Bay for Round 3 in a month’s time. After having the chance to reinstate the Levin’s National Downhill track back into action, it was great to see a great level of support from all the competitors to compete at this once popular venue. New Zealand Downhill Inc are looking forward to placing Levin once again on the series map for next year. Fenwick’s, Wide Open, Kenda Tires and Hirepool Nationwide for all their help and support to make this series possible. 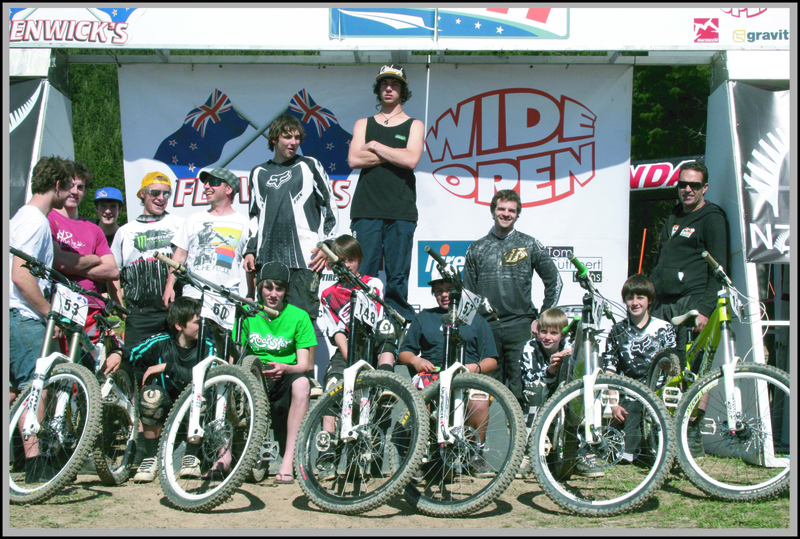 We are all looking forward to NZDH Round 3 in Hawkes Bay on the 5/6th November 2011. This entry was posted on Thursday, October 13th, 2011 at 7:24 pm and is filed under Uncategorized. You can follow any responses to this entry through the RSS 2.0 feed. Both comments and pings are currently closed.